It’s always a blast when The Events Draping Co. is asked to transform the office space for one of 99c Agency’s legendary corporate parties. This time the draping team stepped back a good few years into the decade of Big Hair and Bubble-gum Music: the 80s. Think totally bright colours, disco dancing and mirror balls! 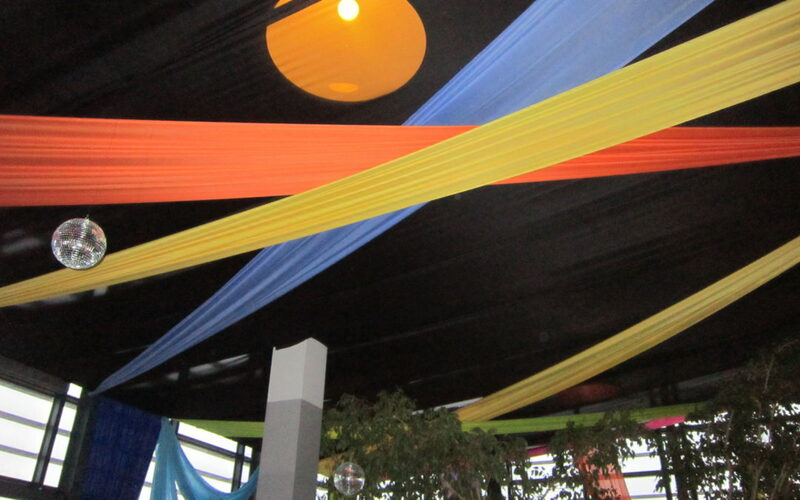 The draping team converted the whole look of the venue by fully draping the ceiling area, walls and partitions in black fabric and then hanging strips of vivid 80s colours like hot pink, lime green, brilliant yellow and electric blue across the black fabric. The bright colours popped sharply against the dark background. The floor to ceiling windows were crisscrossed with strips of fabric from the buzzing neon palate while spinning mirror balls were hung around the dance floor. Party time!